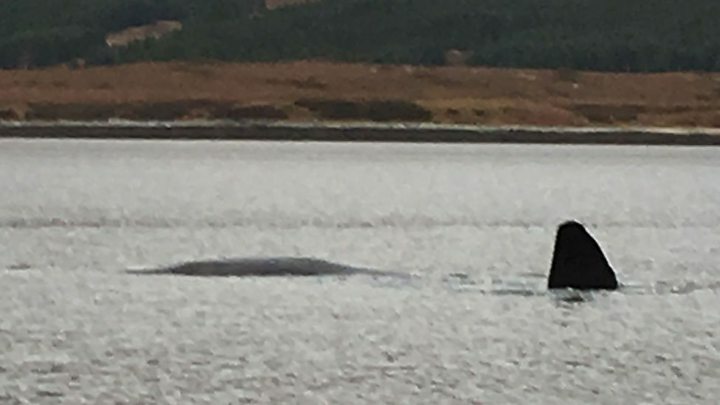 A search of a Highlands loch has found no sign of a sperm whale believed to be in difficulty earlier this week. The animal, which has been estimated to be up to 9m (30ft) long, was reported to have been tangled in rope in Loch Eriboll, near Durness, Sutherland. Coastguard and British Divers Marine Life Rescue (BDMLR) volunteers and Scottish SPCA officers have been monitoring the whale. The whale was reported to the coastguard on Wednesday. BDMLR said it had been unable to confirm if the animal was caught in rope, adding that the it might have been ill or injured. A team from the organisation had hoped to get to Loch Eriboll on Thursday with specialist equipment, but it was delayed. A search of the loch for the whale began at first light on Friday and continued until late afternoon. The BDMLR team will remain on standby over the weekend. SSPCA inspector Maria Bain said sperm whales were not common in the North Sea. She said: "After consulting with marine experts we believe it may be a juvenile that has lost its course. "We hope it has found the way back out to sea and will continue to monitor the situation." Sperm whales are some of the world's deepest diving mammals. Males can grow to more than 18m (59ft) in length and females to more than 12m (40ft). In January 2016, a humpback whale was freed from fishing gear used to catch prawns in Loch Eriboll. The 12m-long had become entangled in creels. Members of BDMLR managed to free the mammal from the ropes and guided it to safety.